Perfect as a statement piece or ideal as part of a layered bracelet look, this sterling silver bracelet is made up of filigree-style hearts linked by simple small hoops. This bracelet is a great way to prepare for a gorgeous summer style giving just the right amount of shine. 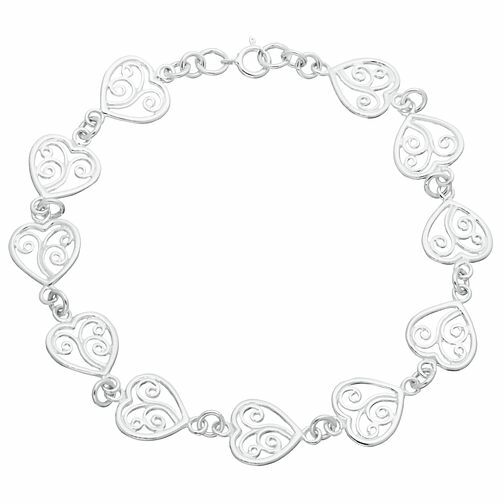 Sterling Silver Filigree Heart Bracelet is rated 5.0 out of 5 by 1. Rated 5 out of 5 by Anonymous from Bracelet Lovely present for yourself or a present. It goes with a necklace I bought and I was very pleased with my purchase . Always happy with my purchasers from samuels.